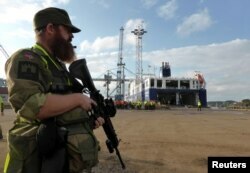 FILE - Portuguese Fuzileiros secure the area after disembarking from an amphibious transport during an exercise as part of NATO's Trident Juncture 2015 in Troia, 100 kms south of Lisbon, Nov. 5, 2015. NATO's largest exercise since the end of the Cold War will see 50,000 troops deploy into the first snows of a Norwegian winter to show Russia that the alliance is ready to repel any attack, officers said Tuesday. Officially, November's Trident Juncture exercise will simulate an attack from a fictional country, but it will bring a huge force into one of Moscow's neighbors just months after Russia's vast Vostok war games. The head of NATO's Allied Joint Force Command, U.S. Navy Admiral James Foggo, said that the exercise "must show NATO is capable to defend against any adversary. Not a particular country, anyone." And he noted that Norway has a frontier with Russia and that the huge force, backed by 150 aircraft, 60 ships and some 10,000 vehicles, would demonstrate that they can mobilize quickly to defend an ally. 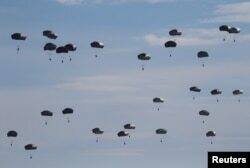 FILE - U.S. paratroopers from the 82nd Airborne Division based in Fort Bragg, N.C., participate in a massive airdrop as part of the NATO Exercise Trident Juncture 2015 at the San Gregorio training grounds outside Zaragoza, Spain, Nov. 4, 2015. "The core exercise area is 1,000 kilometers from the Russian border," said Norwegian General Rune Jakobsen, who will run the exercise headquarters. "There should not be any reason for the Russians to get scared or see this as anything other than a defensive exercise." These will be the biggest such movement of NATO personnel and vehicles since at least the 1991 collapse of the Soviet Union, although smaller than the Vostok-18 exercise staged by Russia and China last month. Exercises like Trident Juncture 18 are designed to teach troops how to move a large force quickly in the event of an invasion against a NATO member triggering the allies' "Article 5" mutual defense clause. The first part of this year's exercise will simulate an effort to halt an offensive launched from northern Norway southwards by part of the force playing an adversary, Canadian General Christian Juneau told AFP. Once the "invader" is halted, the second stage will see NATO forces figuring out how to force it back. FILE - A Norwegian soldier stands guard as German military equipment is unloaded at Fredrikstad, Norway, Sept. 7, 2018. While the exercise is designed to show the 29-nation alliance's unity and strength, it may also bring Western forces face-to-face with some of their own shortcomings. U.S. President Donald Trump has criticized many of the allies for underspending on defense and in February a German parliamentary report found that its own military has outdated equipment, often in a state of disrepair. Officers in NATO headquarters share the concerns, but Juneau told AFP that Germany would contribute a 6,000-strong brigade to the exercise and that the bulk of its troops and vehicles are already in Norway. The rest of the buildup is expected to be complete by October 25, with forces from across Europe and North America arriving by sea and by plane on the alliance's northern flank. The British contingent will land in Europe in the Netherlands and make its way to Norway by road through Germany, Denmark and Sweden to test the alliance's ability to coordinate transport on civilian roads. Once in Norway, the multinational force will conduct multinational training exercises — dealing with traffic and the first snows of winter — and the main invasion exercise.